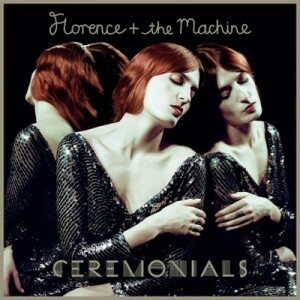 Florence + the Machine released their sophomore album Ceremonials on Oct. 28. If Sinéad O’Connor had hair or, perhaps, if Dusty Springfield had a back-up band of blasting drums and synthesizers, it just might add up to what Florence and the Machine has become. The eccentric British pop singer opened with her debut album Lungs in 2009 to much critical acclaim and a number of accolades to boot. Now with her sophomore album, Ceremonials, Florence transforms her rich soul-belting routines into blasting anthems marked with romance and nostalgia. Lungs was petite. Not that it was small in nature—five minute songs can attest to that—rather many of the songs had a high-pitched Florence crooning over plucked violins and faerie-like sound effects. If Lungs sprinkles, Ceremonials gushes with much more confidence and a much richer, fuller sound that usually comes along with years of studio mastery. Florence and the Machine have been lauded over the years for the unprecedented maturity that characterizes many of their songs. On Ceremonials, that maturity persists, but with much greater understanding. With many pop singers, finding a niche among the endless torrents of party rock anthems can be just as important as winning a Grammy. Katy Perry established herself as the girl-next-door with a dark side, Kesha as the hangover-prone club regular and Lady Gaga the spiritual hybrid of Dee Snider and something that barely resembles Madonna. Florence lies somewhere between the Greek goddess Athena and the girl that writes poetry on a lonely Saturday night. That isn’t to say that Florence has very much in the way of variety. In fact, repetition and loyalty to form is what limits Ceremonials. The opening song “Only If for a Night” is a superb track with its primal drums crescendoing into a burst of symphonic keyboards. Yet the singles “Shake It Out” and “What the Water Gave Me” follow that same beaten path of grandiose keys and choral backing vocals, so that really any of the songs on Ceremonials could have served as singles. That won’t disappoint Florence fans or even new listeners, but an album of 12 tracks all over three minutes of similar compositions might have been better served with fewer tracks and greater variety. The upshot to that case is that many pop singers have ascended to their thrones in the mythical land of the Music Industry by giving listeners what they want and what has worked countless times before. By that same token, many artists haven’t claimed that same status of Universal Enjoyment because their sounds are far too abrasive for the daily radio wrap. Florence and the Machine bordered on insignificance, yet British radio presenters—often more liberal with music selection—blasted her tunes “Kiss With a Fist” and “Dog Days are Over” until they finally seeped into the Atlantic and were fished out by commercial stations in the US. Is it just me or does anyone else think she is just bad?